"Molly, our 13-year-old black lab was diagnosed with kidney disease and was given only a few months to live. My husband and I were stunned with the diagnosis. Needless to say, we were not optimistic about her future. That weekend, we went to the Pet Expo in Baltimore and were lucky enough to talk to a vendor who recommended we contact AskAriel.com We used Renelix , the Kidney Health Formula and Amazing Omegas. We've been treating her with these supplements, following the Ask Ariel diet suggestions, in addition to administering sub-q fluids and 5 months later Molly is still eating, drinking and very much full of life. We know that she is still with us because of Susan Davis, her expertise and compassion and the Ask Ariel supplements. 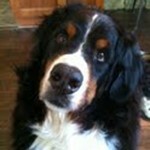 We are so grateful we found Susan and AskAriel and have already started our younger dog, Brandy on the Amazing Omegas." Kidney failure can come on suddenly, but there are some subtle warning signs. 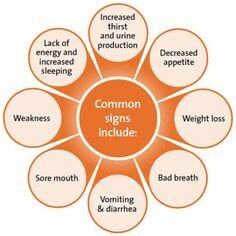 If your pet shows any of these symptoms of kidney disease, even if your pet still seems to be ok, take your pet in for laboratory testing! Many times the full effects of kidney disease don't appear outwardly until the kidneys are already beginning to fail. The best time you can help your pet is when chronic renal failure (CRF) is caught in the early stages. 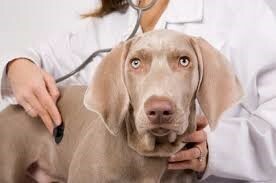 It is also the most commonly diagnosed disease when a pet is in their senior years. Some young pets have a congenital deformity that can also affect kidney function. Kidney failure occurs more commonly in cats than dogs. The disease can progress rapidly in some and slower in others. Laboratory monitoring is key as the pet may not show a great deal of symptoms until the kidneys are failing. The best time to help your pet if diagnosed with kidney disease, is when the disease is in its early stage. This requires routine laboratory testing. Having baseline lab results from a healthy adult pet is essential rather than waiting until your pet is in an advanced stage. How Can I Help My Pet Diagnosed With Kidney Failure? Kidney Failure Treatment for dogs and cats works best when a combined approach used both conventional and holistic treatments is used. Conventional treatments involve the administration of subcutaneous fluids, phosphorous binders, management of symptoms and a "prescription" kidney friendly diet. The goal of treatment is to help the pet to live as close to a normal life as possible and slow the progression of the disease. Once the kidneys have been damaged, they cannot be repaired, but you can strengthen and support your pet's nephrons (filtering units in the kidneys) which will help them function better. Supplements can help flush out the toxins and control acid-base imbalances. Renelix is the first line of defense with kidney disease. It helps the body to flush out toxins that accumulate in the kidneys and urinary tract. While in many instances it will help slow the progression of the disease, we have had some reports of pets actually having improved laboratory tests after using Renelix. Kidney Health is an enzyme that helps to break down protein, enhancing digestion and reducing the workload on the kidneys. Purrfect pet CoQ10 contains NON-GMO Ubiquinol. This antioxidant plays a critical role in cell production and is essential for kidney and heart function. For small pets under 10 pounds, topical antioxidant OxiCell SE contains a small amount of CoQ10 and is also very helpful. Amazing Omegas are packed in glass bottles to preserve freshness and quality. Simply the best, purest fish oil available for pets. Research on fish oil has shown it to be helpful for kidney disease. Gastro ULC + Power Probiotic--one of the hallmark symptoms of kidney disease is that pets develop acid stomach and inappetance. Pets become very picky and it is very stressful for the pet owner trying to find something that they will eat. Gastro ULC and Power Probiotic helps relieve stomach discomfort, increasing appetite. Diet can also be a huge challenge as pets are reluctant to eat. The prescription diets, while low in phosphorous, contain grains and allergens which can problematic for many pets. Please include your pet's diet on the order form at checkout and we will be happy to recommend a more natural kidney friendly diet for your pet on the packing slip that comes with the product directions.